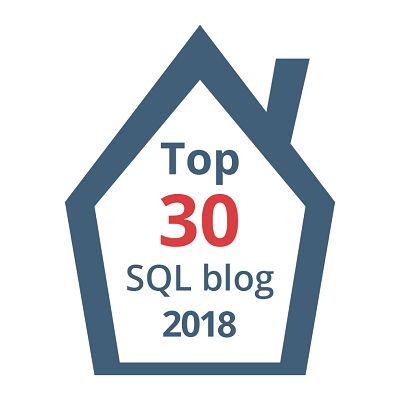 Today I got some leisure time and thought of Installing SQL 2012 on my Win8 machine and sharing my experiences at a very high level. Well, I’ve Installed SQL Server 2012 RC0 on my Windows 8(Consumer Preview – Evaluation Copy, Build 8250) Machine. To be honest, I was expecting few bugs and annoying errors. But let me tell you this, My Installation went Flawless. FYI, I’ve Installed only basic components(DB Engine – with Replication, SSIS,Complete Client Tools, SDK Connectivity). Just a screenshot of how it looks like on Win8. Well, Technically there is no difference in how SSMS looks and how it behaves, but as most of you are already aware of…there is no START Button on my Menu bar on my Desktop! See below on the bottom Left corner. 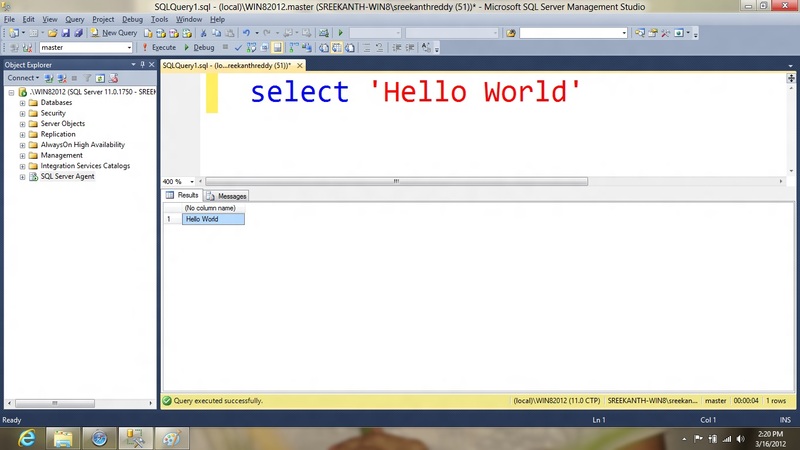 So, where did I open SSMS from?? If you said “Metro Screen” yes, you are correct. See the below Screenshot for how Windows8 organized programs on my Metro Screen. Hmm…this is something which really disappointed me. Basically, It created bunch of Apps for each exe! 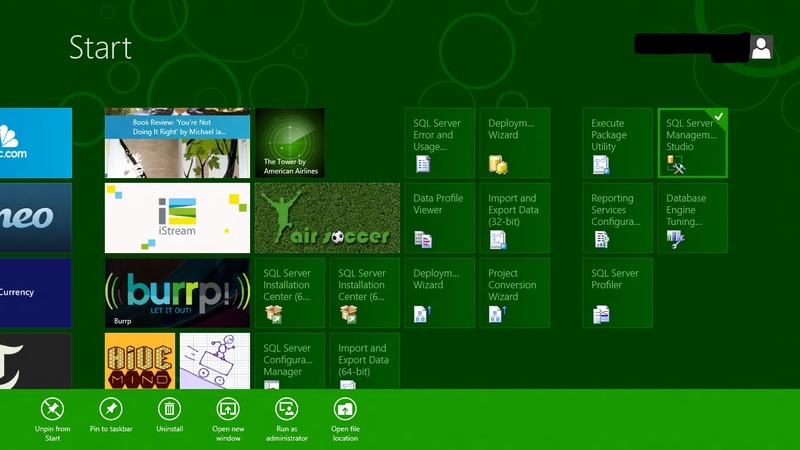 Imagine how ugly your Metro Screen gets if you Install all the components of SQL Server!! I Wish it was smart enough to create at least folders/Groups and place related exe’s accordingly. Previous Article whoami and echo in Windows? ?